When the DiMeos land in the hospital on Thanksgiving, Maya's determination to save the holiday leads to an uneasy truce with her rival, Melanie Hertzal; and Jimmy gets jealous when Kenneth bonds with his brother, Billy. Meanwhile, wounds from an old breakup are re-opened, but Ray finds brand-new love in an unlikely place. 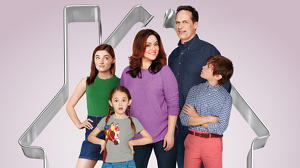 The DiMeo family all have their own unique personality: a take charge mother (Maya) with an outlandish but no-holds-barred attitude, a husband who seems to be smarter than he thinks, a no-nonsense athletic daughter, a middle child who's the "brains" in the family, and their teenage son with special needs. The DiMeos are about to bring all that from a middle-class neighborhood they despised because of the location itself to a more upscale town in an effort to improve their way of life, with imperfect results. As Maya fights injustices both real and imagined, the family works to make a new home for themselves and searches for just the right person to give JJ his "voice".